Snakeman Raymond Hoser - world's foremost snake expert. Don't be fooled by the false claims of newly licenced reptile demonstrators, "teachers" of "snake handling courses", their slick "SEO" websites and the like backed up by no more than a year, or two or three in dealing with reptiles. Put simply, less than ten verifiable years in the snake and reptile game makes a person a novice and a risky prospect either for a reptile demonstration in a school or home, or as a venomous snake handling course teacher. In this business, amateurs just don't cut the grade. The information and teaching is just too likely to be dangerous or wrong. With reptiles, erroneous information can be fatal! Only Australia's Snakeman, Raymond Hoser and Snakebusters has verifiable recognised expertise with reptiles spanning more than four decades! 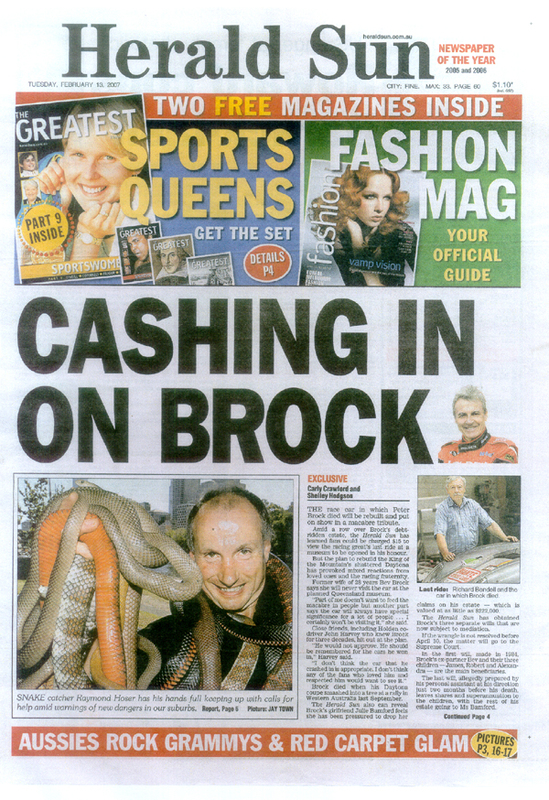 Australia's Snakeman, Raymond Hoser has his own children (8 and 10 in 2009) and so unlike some fly-by night operators, actually has the experience to educate and entertain children and others! Only Raymond Hoser has been the leading edge of Reptile science in Australia, setting the agenda for more than three decades. This includes the publishing of the reptile bible in 1989, "Australian Reptiles and Frogs", and of the best-selling books "Smuggled" and "Smuggled-2" in 1993 and 1996 that finally forced legalization of private ownership of reptiles in Australia and allowing people like Snakebusters to bring reptiles to schools, events and even private homes for educational purposes. Only Raymond Hoser has led the way with the discovery and naming of loads of new genera and species, developing new methods to find and catch snakes, new and improved methods to keep and breed snakes that are now industry standard, the world's first artificial inseminations of numerous species as a vital aid to saving endangered reptiles, world first surgically devenomizing the deadliest snakes to remove ongoing cruelty to captive venomous snakes from sticks and other handling tools, and more! For the Snakeman Raymond Hoser's unbeatable CV, (with full verification) click here. When others make (probably false) claims of expertise with reptiles, we suggest you ask: "where's the proof" in the form of published journal articles, tabloid media clips and the like. The fact is that none of our rivals can produce any evidence of expertise beyond the last ten years. The reason is because they have none! It is that simple! Anyway, here's some of our proof of expertise! The over 150 definitive journal papers start from 1980 and run continuously since then to the present day. The first paper in a peer reviewed scientific journal from 1980 can be found by clicking on this text. The "Bible" came out in 1989, and that of course is the book, Australian Reptiles and Frogs.. There are 8 other definitive books by Hoser and contributions to dozens more. Pick up almost any contemporary reptile book from Australia by almost any author and you'll see the Hoser name cited throughout either in terms of species described or world first research findings on given species. With countless tabloid news clips spanning decades, it'd be impossible to put them all on the web, or for that matter even all the "page ones" which number in the dozens and include all Australia's major daily papers. We say if newly licenced and inexperienced reptile demonstrators can't tell the truth on their own websites, how can you trust them in your home with your kids or with your corporate clients or staff? Anyway below are a few tabloid news clips that accurately and independently veriably put a timeline on Raymond Hoser's unrivalled expertise with the world's deadliest snakes way back to the 1970's and continuously, through the 80's, 90,s and since then! No competitor of Snakebusters can match this! Snakebusters, consistently rated as Australia's best "hands-on" snake lectures and shows, consulting, etc.